In an effort to reduce delinquent loans on their books and provide foreclosure prevention, Fannie Mae has begun to market their first pool of non-performing loans (NPLs). The pool contains 3,200 loans with a total unpaid principal balance of $786 million, according to Fannie Mae. The sale will follow the new Federal Housing Finance Agency (FHFA) NPL Requirements that were announced in March, including the requirement that loan modifications are offered to the borrowers. According to the FHFA, the loans included in these sales are severely delinquent – typically more than a year past due. Servicers are required to report on the borrower outcomes in order to document if the desired outcomes are achieved. The enhanced requirements presented by FHFA are expected to reduce losses by Fannie Mae and Freddie Mac and improve neighborhood outcomes. 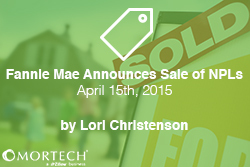 Fannie Mae previously announced plans in early April to begin offering more transactions similar to this one. Information regarding registration and specific pools available for sale are located at http://www.fanniemae.com/portal/funding-the-market/npl/index.html.